A wildly popular Chinese news app is fast becoming one of the world’s hottest upstarts. Founded by a former Microsoft (MSFT) employee, Toutiao uses artificial intelligence to create personalized feeds of news and videos based on users’ interests. And it has global ambitions. Toutiao, which means “headlines” in Chinese, wants to become the world’s No. 1 destination for online content. Investors are betting it knows what it’s doing: they put a valuation of $11 billion on Toutiao following a recent fundraising round, according to CB Insights. Twitter (TWTR), by comparison, is worth $12.3 billion. The app is the brainchild of 33-year-old Zhang Yiming, who started it in 2012 after previously setting up a real estate portal and working for an online travel company. Former employees describe him as a thinker who spends his free time writing code and reading about management and technology. So how does Toutiao make its money? The app analyzes its users’ social media interactions and the content they consume, which it sources through more than 4,000 partnerships with media companies. 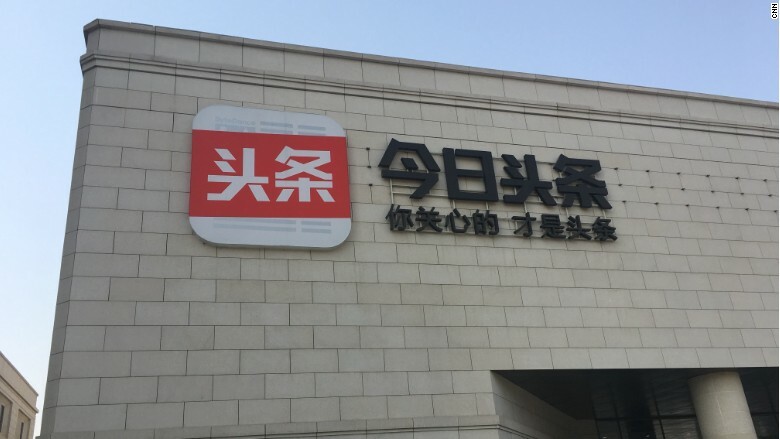 Toutiao’s number of daily active users more than doubled last year. Executives believe they have developed some of the most sophisticated content-recommendation technology in the industry. Users open the app and are offered news without the need to follow other accounts, which makes it different from platforms such as Facebook (FB) and Twitter. Its formula seems to be working so far. Users spend an average of 76 minutes per day on it, making it an attractive destination for advertisers. Through its data, advertisers can target users by age, location and interests. 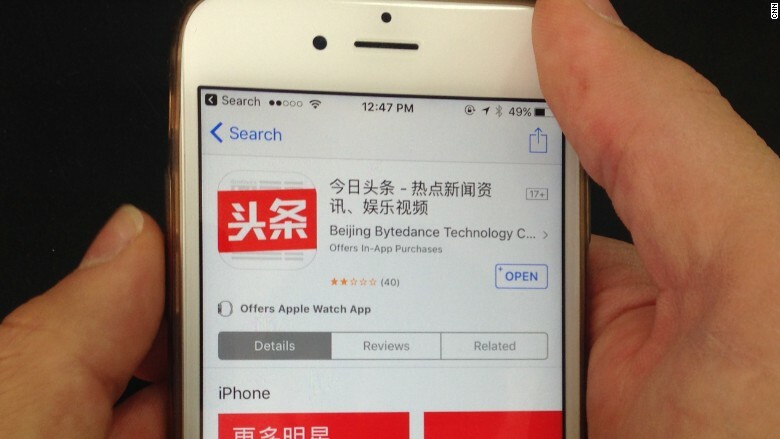 “The site is very easy to navigate for the type of news you’re interested in and keeps alerting me to the latest news,” said Shangda Wu, a 26-year old biotech worker who has been using Toutiao for six months to monitor financial news for work. Like Facebook and Twitter, Toutiao is also doing battle with fake news and inappropriate content. Penalties for users who post offending content risk suspension from the platform and even the deletion of their accounts, the company says. It’s also using artificial intelligence to weed out such content. News-hungry people in China are flocking to the app: its number of daily active users more than doubled last year, from 30 million to 78 million. It now has more than 100 million, according to a person familiar with the matter who asked not to be identified because they weren’t authorized to speak publicly about it. It’s gaining ground on Weibo (WB), China’s closest equivalent of Twitter, which has 154 million. But both are dwarfed by Facebook’s 1.28 billion. Toutiao’s challenge is to keep up the momentum in a crowded market. It’s already taken ambitious steps to grow in China and beyond. In February, it bought Flipagram, a Los Angeles-based video startup, giving it a foothold in the U.S. It also owns English-language news app TopBuzz, a stake in an Indian news aggregator and is considering expanding into Brazil and Japan. The headquarters of Bytedance, Toutiao’s parent company, in Beijing. Its workforce has grown rapidly to around 4,000. To house the droves of new employees it’s been hiring, the company recently moved out of central Beijing to a bigger, more modern site in Zhongguancun, a northwestern part of the capital known as a hub for tech firms. The company’s executives have also begun talking to banks about an initial public offering, potentially in the U.S., although the timing has yet to be decided, according to people familiar with the matter. A spokeswoman for the company declined to comment.